Are magnetic smartphone mounts for your car a good idea? Is it OK to have this DC2 disc magnet so close to my iPhone? Can strong neodymium magnets be used to mount a smartphone in your car? Apple's design guidelines recommend avoiding the use of magnets in phone cases and accessories, but people are doing this anyway. Is it OK for the phone? Will a strong magnet interfere with its operation? Apple recommends avoiding the use of magnets and metal components in accessories. minimize interference with the digital compass and must not repeatedly trigger compass recalibration. This is a complex subject. We know a bit about magnets and magnetic fields, but smartphones are complex devices. When considering whether a nearby magnet will affect the operation of your favorite mapping app, there are a lot of pieces to consider. Just thinking about the magnets, our initial questions are what you might expect from magnet engineers: What kind of hardware sensor is in the phone? Where is it located within the phone? How close will the magnet be to the sensor? What magnetic field strength and direction will the sensor see? These questions are the easy part. It’s the hardware, operating system and mapping apps that get complicated quickly. How do mapping apps work? Why would they rely on magnetic field sensor data anyway? The mapping app knows your position based on GPS signals. 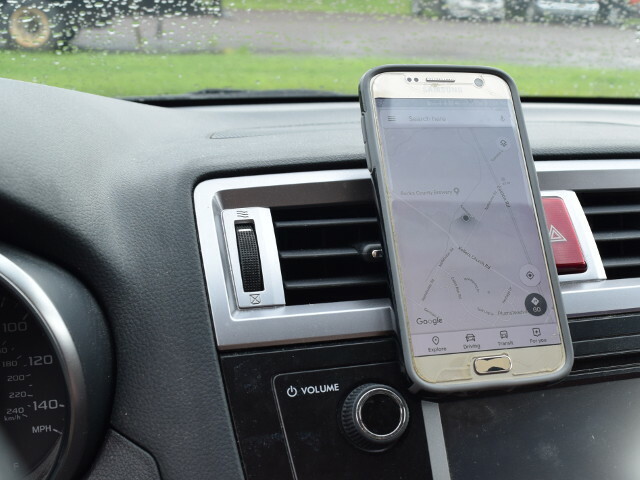 GPS determines the phone's position, but doesn't say anything about which way the phone is facing. GPS doesn't tell it which way you've pointed the phone. gyroscope data (sensing rotation of the phone). The phone intelligently incorporates the data from each of these sources to put together a best guess about which way the phone is facing, along with a confidence factor of how sure it is. That sounds pretty complicated. Why is all this necessary? It’s useful to know the phone’s direction for driving apps, but it also makes so much more smartphone interaction possible. Many games use this data if turning or moving the phone is part of the controller. The phone uses this data to automatically stitch photos together when creating a panoramic photo. There are many other examples; these are just the tip of the iceberg. OK, but does it matter? I just want to mount my phone with a magnet! Consider how altering the magnetic field might affect the phone’s knowledge of which way the phone is facing. If the compass isn’t calibrated, the phone might think it’s pointing in a different geographical direction. In the list of 3 sensors, only the magnetometer/compass indicates absolute position. The accelerometers and gyroscopes can only indicate relative direction. Hey, a second ago you were pointed in one direction, but now you seem to have turned ten degrees to the right. They can get the change in direction right, but don’t know east from west. When you first fire up the mapping app, it’s the magnetometer/compass that knows which way you’re facing. Smartphones are pretty smart. If you start wiggling a magnet near the phone, the magnetometer will see wildly varying magnetic field strength and direction. If the algorithm sees that the accelerometer and gyroscopic data aren’t changing at all, the phone is probably sitting still. It’s often smart enough to disregard that crazy magnetic data and determine that the phone is probably not moving. Where this algorithm lives isn’t completely obvious to the end user. Is it a part of the operating system (iOS or Android)? Or does this smart stuff happen in each app? It varies. Each mapping app might handle things differently, or look at different position sources within the operating system. The video below shares some of the highlights of our testing with magnets and phones to try and understand how this works. Magnets do have some effect, but mapping apps manage to keep working despite the hindrance. The phones we tested seemed to work OK. The magnet didn't adversely affecting the mapping apps we tried. There can be some calibration issues where it initially thinks you're pointing in a different direction, but we thought this was pretty minor. How do I actually make a phone mount for my car? Demonstration of a phone mount using a NSW62 steel washer and BC62 block magnet. So far we've focused on whether or not it is OK to have a magnet near the phone. We haven't mentioned anything at all about how to actually make an effective mount. In fact, the design of such a setup could probably fill another whole article! There are a lot of options to consider, and many ways of solving the challenge. One thing always stands out to us: Good mounts use magnets in combination with some mechanical fit or stop that prevents sliding of the phone. We've shown this concept here with a simple model. The steel disc glued to the back of the phone case fits inside a notch to meet the magnet. The magnet holds it in place, but the mechanical fit of that steel disc sitting in the plastic notch prevents the phone from sliding down on a bumpy road. This concept is discussed in a more general way in previous articles such as Leverage & Friction and the Belt Clip Hammer Holder. One final disclaimer to keep in mind: We’re magnet guys, not smartphone experts. Apple says not to put magnets in phone cases, so there might be other reasons not to. 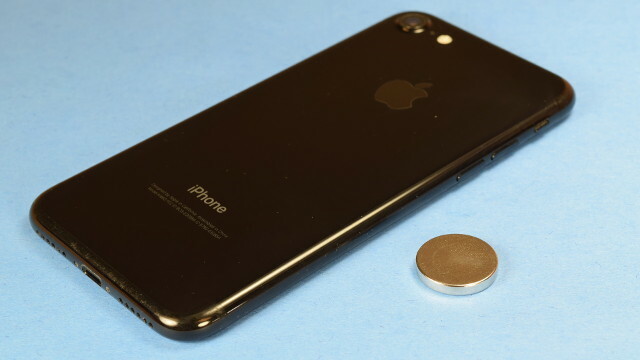 Back when we did an article about iPhone Magnetic Measurements, we placed some strong magnets near an iPhone. With all the apps that use position data, that old iPhone 5 was a little flaky for weeks afterward. Our theory is that the powerful magnets might have weakly magnetized some of the steel components inside the phone, in the same way you might magnetize a screwdriver by rubbing a magnet against it. By “making” weak magnets inside the phone, it messed with the sensor somehow. Only after much time passed and that magnetization faded did the phone settle down to normal. If you’re embarking on putting magnets near a phone, try to keep this in mind. Keep the magnets as small as possible and as far as from the phone as you can while still getting the job done.